Based on the worldwide best-selling book series and set in contemporary New York City, a seemingly ordinary teenager, Clary Fray, discovers she is the descendant of a line of Shadowhunters, a secret cadre of young half-angel warriors locked in an ancient battle to protect our world from demons. After the disappearance of her mother, Clary must join forces with a group of Shadowhunters, who introduce her to a dangerous alternate New York called Downworld, filled with demons, warlocks, vampires, werewolves and other deadly creatures. The 'Mortal Instruments: City Of Bones' competition has now closed. Winners will be announced shortly. Competition opens at 6pm AEDT on Monday 16th December 2013 and closes at 11:59pm AEDT on Monday 23rd December 2013. Five winners will be chosen at random on Tuesday 24th December 2013. To successfully win, entrants must fulfil the above entry conditions before the time the competition closes. Current members/followers are eligible to enter the competition. Only one entry per person. Only one winner per household. To be a valid winner, the entrant must not have won a prize from SWITCH within the last 28 days. Each winner will receive one Ultraviolet Blu-ray copy of 'Mortal Instruments: City Of Bones'. By entering, you agree to receive occasional emails from SWITCH in the future. If you decide to unsubscribe from these updates, any further entries will not be applicable. Only Australian residents are eligible to enter. 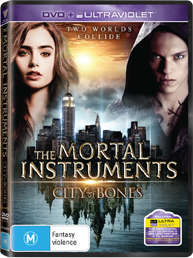 'Mortal Instruments: City Of Bones' is available on Digital Download, Ultraviolet Blu-ray and Ultraviolet DVD on Wednesday the 18th December 2013 from Roadshow Entertainment.